At the end of May 1968 John Lennon made his first public appearance with his new girlfriend Yoko Ono at the opening of a second Apple fashion outlet at 161 King's Road. It was originally a shop called Dandy Fashions and run by Australian designer John Crittle who designed clothes for The Rolling Stones, The Who, Procul Harum, Elvis Presley and Jimi Hendrix. Dandy Fashions had been a joint venture with Tara Browne, a friend of The Beatles and heir to the Guinness brewery fortune. Tara died in a car crash in December 1966, prompting a verse in the Beatles song A Day In The Life. John Crittle went into business with The Beatles in February of 1968, George Harrison remembering that "we bought a few things from [John Crittle] and the next thing we knew, we owned the place!" John was a highly respected designer and retained the position of Director of the enterprise working alongside Apple manager Neil Aspinall and Apple accountant Stephen Maltz. This store was re-named Apple Tailoring and specialised in civil and theatrical wear. 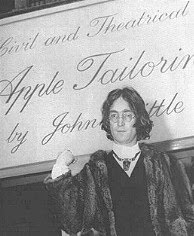 When the Apple Boutique closed, the Beatles ended their connection with Apple Tailoring and gave the premises back to the manager. Paul McCartney issued a press statement declaring that "The Kings Road shop, which is known as Apple Tailoring, isn't going to be part of Apple anymore. But it isn't closing down and we are leaving our investment there because we have a moral and personal obligation to our partner John Crittle, who is now in sole control." In 1975, John Crittle split up with his wife Andrew, leaving her and their six-year-old daughter behind and moving back to Australia. Their daughter Darcey Bussell (who took on the surname of her stepfather) was estranged from her father but made him very proud when she became the Royal Ballet's youngest principal ballerina at 20 years old. He returned to London two years before his death to watch his daughter dance but she refused contact with him. He died aged 56, suffering from emphysema.